Sustainable WAter Security through the Development of Artificial Glaciers (SWASDAG) is an international project proposed by the Group of Atmospheric Science at Luleå University of Technology, and funded by the Swedish Council for Scientific Research (Vetenskapsrådet), aimed to the installation of artificial glaciers in the region of Ladakh, India, in order to palliate the water shortage suffered by the inhabitants of the area. The changing climate, together with the increasing influx of tourists in the region, have caused a dramatic decoupling between the hydrological cycle and the agricultural ones over the last decades. As a result, the significant delivery of water from the melting of natural glaciers has shifted to the month of June, while the crops growing period of April to May shows a critical scarcity of available water, posing a severe constraint which impede not only the development of the region, but the reaching of an appropriate life standard for its inhabitants. The engineer Chewag Norphel advanced the idea of constructing artificial glaciers to act as water reservoirs whose melting can be controlled by selecting suitable allocations in which the melting conditions are foreseeable. This way, a steady water supply could be obtained during the cropping process. The idea showed to be optimal as a solution, so it was improved later by Sonam Wangchuk, who introduced the concept of the Ice Cones. It consists of the freezing and storage of the water that keeps flowing and wasting away down the streams and into the rivers throughout the winter in strategical points in which it instead melts when water is needed, i.e. during the springtime. 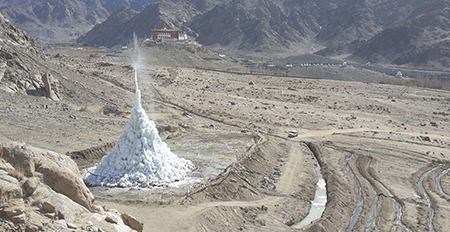 The ice cones, as well known as Ice Stupas (because of the similar shape to that of the relics containing buildings) are basically huge ice towers with a conic shape of 30 to 50 m height, which can be built right next to the villages where the water is needed. Very little effort or investment would be needed except for laying one underground pipeline from a higher point on the stream to the outskirts of the village. Normally the head difference is easily 100 m over a distance of roughly one to three kilometres. The idea is very simple and needs no pumps or power, as the water maintains its level automatically. The ice cones can be installed almost anywhere, at any scale, and on almost any surface, provided a feeder stream which can be diverted from elevations above. 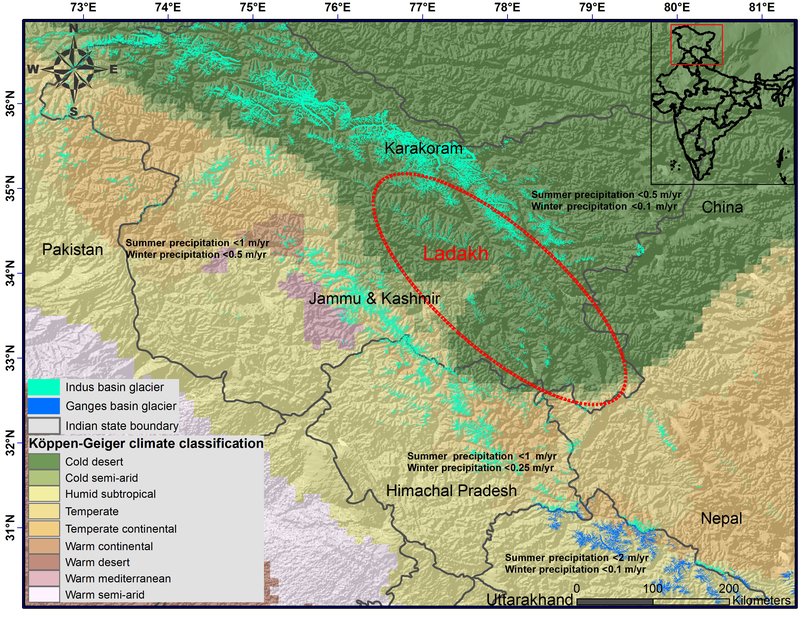 However, there is a remarkable lack of background scientific data on the region of Ladakh supporting the broad suitability of the ice cones system. So far, the installation of artificial glaciers is carried out in a rather improvised manner, due to the lack of technology, resources, and time to perform a thorough analysis of the glaciers’ performance. In this sense, SWASDAG project will come to help establish a systematic study of the area, since the development and application of the related technics are in an intermediate stage, and there is still pending matters before its extensive application there. The joint research teams from LTU and Jawaharlal Nehru University (New Delhi, India) is composed of trained glaciologists, hydrologists, remote sensing specialists, atmospheric scientists, and engineers, and will focus on the addressing of some practical issues and technological challenges regarding the progress of the project. To install environmental monitoring stations at different altitudes for estimating a seasonal profile of the relevant parameters. To perform high-resolution geospatial terrain modeling and site-suitability analyses regarding the above parameters, to identify the hotspots for installing more artificial glaciers. To study snow physical properties in lab and in situ to suggest engineering structures for making the artificial glaciers more sustainable. To organize joint seminars and workshops for capacity building and community awareness on sustainable water security. To design and suggest policies for sustainable implementation of the research outcomes. The project includes the design and suggestion of the necessary policies to be implemented by the local governments, as well as the technology transfer for its optimal further management.